USES Immune stimulant, Colds, Flu, Infections. 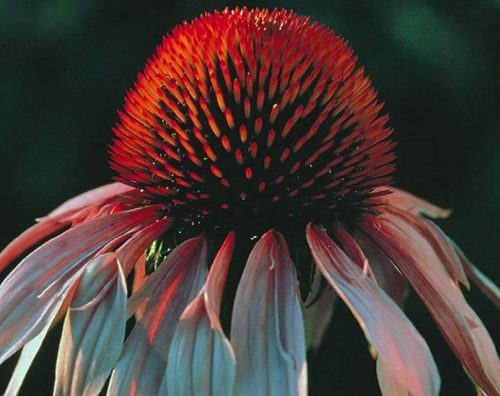 The Echinacea herb is one of the most popular herbs used in Europe. It is considered to be the prime remedy for the Immune system and this view has been supported by extensive research. HOW IT WORKS Echinacea works principally by stimulating a group of cells in the Immune system known as the macrophages. These cells have the unique ability to ‘eat’ matter foreign to the body, such as viruses, bacteria and other particles entering the body. Stimulating the Immune system in this way improves the way the body handles infections, when viruses and bacteria do damage to invade the body. Clinical trials have shown that Echinacea can improve the symptoms of cold and flu, shortening the course of the illness in over 80 % of people.